Earlier this month, my aunt Carole passed away. She was a kind soul and will be greatly missed. My cousins asked me to write something for her memorial service, which I did… with the blessing of my family, I’m sharing it here. and gliding toward flocks familiar. and resting where the sand meets the water. 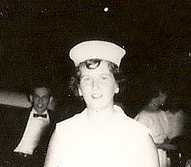 Photo note – the picture above was taken at my parents’ wedding in 1957, when Carole was about 16. Word has it, after the ceremony, she and my Aunt Sharon (on dad’s side) went carousing down by the Chatham, Mass. Coast Guard Station, and that’s when Carole met my Uncle John. Don’t you just love it. Beautifully written. I am so sorry for your loss. My sincerest condolences on your loss Jac. This is a wonderful tribute. And a great photo. Take Care. Thank you Joe, my fellow Writer’s Group member! Means a lot.